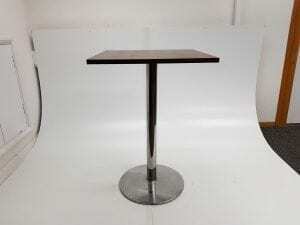 We currently have these 2 square top poseur tables, finished in walnut, in stock. Combined with some funky black office stools these would transform any office breakout area. To obtain further information about these products, including dimensions, estimated cost and delivery options, you can get in touch with one of our sales team by calling 07944 508282. If you are viewing our website using a Mobile Device, you can also use our Telephone Icon, located at the bottom right hand corner of the screen. 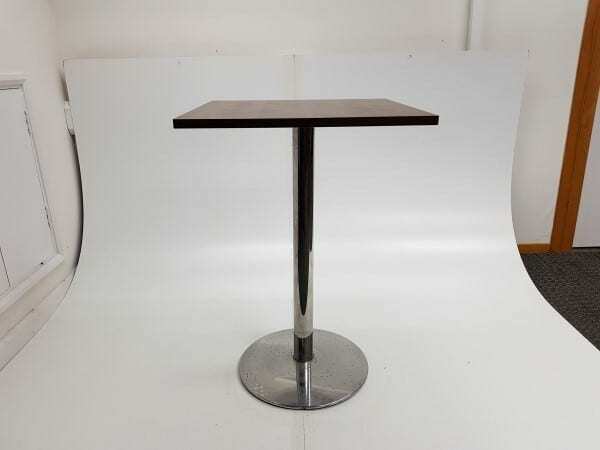 If you were looking for another particular product(s), we have a wide range of other poseur tables and breakout furniture in stock at the moment, which you can view by clicking on the link. Chrome column with disc base.